Fender Monterey review | What Hi-Fi? Anyone with even a passing interest in what still gets called rock ’n’ roll cannot fail to be familiar with the Fender brand. Few are the guitar heroes who haven’t at some point sported a Fender Stratocaster or Telecaster. Few are the big bands that haven’t taken to the stage on front of a wall of Fender amplification. As brands go, Fender is one of the music world’s more evocative – it has stuff in common with Ford or Coca-Cola beyond an overly fancy typeface for its logo. Fender has no real pedigree where domestic audio equipment is concerned. Mind you, neither did Marshall (an equally iconic brand in guitar amplification), but that didn’t stop it from launching a range of consumer-focused products, of admittedly variable quality. 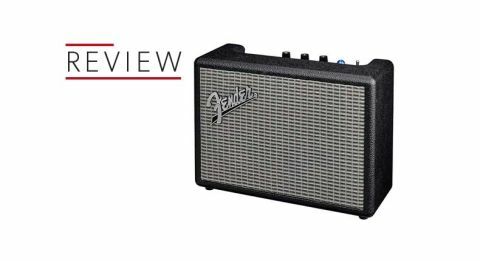 Fender quite obviously fancies a piece of the action – which brings us to this, the Fender Monterey wireless Bluetooth speaker. Styled on Fender’s classic guitar-amp range, we reckon it will split customers into two camps. The first camp is Guitarists, who will see the Monterey’s looks as a trivialisation of their art and craft. The second is The Rest of Us, who will be thrilled at how much like a little Fender guitar amp the Monterey looks. Not that it’s out-and-out little by the standards of Bluetooth speakers. The Monterey weighs in at around 7kg, and at 25cm tall it cuts quite an imposing figure. It’s mains-powered only – at least Fender hasn’t tried to pretend the Monterey is a go-anywhere portable device. It’s a hefty thing, wrapped in leatherette and textured grille just like the company’s guitar amps. The pro design cues keep coming – the top panel has three of the classic ’witch-hat’ rotary knobs for volume, treble and bass control and a hugely satisfying toggle switch to turn power on and off. It’s the type of switch you can authentically throw. The panel also features a blue ‘amp jewel’ light indicator of power status, a 3.5mm analogue input, a source selector and a button for Bluetooth pairing – the Monterey features aptX Bluetooth capability. Around the back there’s a socket for kettle-lead mains power and a stereo pair of RCA inputs. That’s the lot. Under the skin, the Fender wireless speaker features a claimed 120W of amplification power, plus two 12.5cm woofers and two 25mm tweeters. Which is a business-like set of numbers. When switched on, and also when wireless pairing is achieved, the Fender Monterey gives a little guitar-strum of acknowledgement – a pleasing touch but a little cheesy at the same time. We get underway with a Tidal-via-iPhone 7 file of Flamin’ Groovies’ Shake Some Action and the Fender immediately reveals itself as an up-and-at-‘em listen. Drums punch purposefully, the bass guitar is deep and textured, and vocals are insistent. There’s decent detail retrieval on display, too, with background maracas given just as much attention as the echo around the edge of vocal harmonies. Throughout, the Fender speaker motors along at a clip, as if it’s involved in a race with itself to get to the end of the song. It’s an assertive presentation but not overly aggressive – the overall tonal balance is warm-ish and engaging. It’s worth noting that, although the three rotary controls are marked ‘1’ to ‘10’ in the guitar-amp manner, choosing ‘5’ as a safe middle ground is not good – it’s too loud, too bassy, too trebly, altogether too much. Nice to know the Fender Monterey can go unconscionably loud, mind you. It’s not mindlessly attacking, though. Ease back with a listen to Rumer’s take on P.F. Sloan and the Fender does good, informative work with her impeccable vocal. Acoustic rhythm guitar is loaded with information about the material of the string and the method of strumming, and distant pedal steel guitar shines benignly in the background. What the Fender Monterey comprehensively cannot manage is timing – it almost sounds as if it’s given up trying. Whether handed a rigorous test like Thundercat’s frantic Uh Uh or an altogether easier examination like Byetone’s Plastic Star, the Fender cannot get differing elements of a recording on to nodding terms – let alone integrate them into a coherent whole. It’s never less than a warm and friendly listen, but it struggles badly with fitting different pieces of a recording together harmoniously. Consequently tricky rhythms never quite flow, bass sounds disrupt rather than dictate tempos and there’s a two-left-feet aspect to much of what the Fender does. In many ways the Monterey is a likeable device. It looks – to us, at least – brilliant, it’s capable of unlikely feats of volume and its tone is comfortable. Friendly, even. That may be enough for some, but we cannot overlook its inability to time a recording with anything approaching skill. For us, it makes the Fender a diverting alternative to the best Bluetooth speakers around but not a serious rival.